Bloodborne is the latest game developed by FromSoftware, and a spiritual successor of sorts to the Souls series of Action-RPG’s. (Demon’s Souls, Dark Souls, and Dark Souls 2.) Whereas the previous games focused on slower-paced and deliberate combat, Bloodborne is all about speed and agility, or at least it tries to be. Bear in mind that I am a huge fan of the Souls games, having completed all three multiple times, and while I don’t exactly miss the plodding pace of them, I can’t help but feel the speed in Bloodborne lacks a good sense of control. The levels in Bloodborne do not lend themselves well to this new fast paced combat system, often feeling cluttered and small. Your character constantly gets stuck on small objects in the environment, being able to smash through pots and barrels with ease, but getting tripped up by candles and nightstands is infuriating to say the least. The difficulty curve of Bloodborne is completely broken, the second boss being the most difficult in the game, enough to force some players to give up, but every other boss can be defeated in only a few attempts at the most. This also goes for the enemies in the environment, you’ll fight and kill enemies in one hit, and then have to fight similar enemies half an hour later with five times the health. New Game plus, where you can carry over your stats and equipment from the end of the game to a new game, ratchets up the “difficulty” by making every enemy take more damage, and do more as well. Adjusting variables is an extremely lazy way to add “difficulty”, and it shows, New Game plus being the most frustrating part of my experience due to enemies killing me in one or two hits, not to mention the bosses. 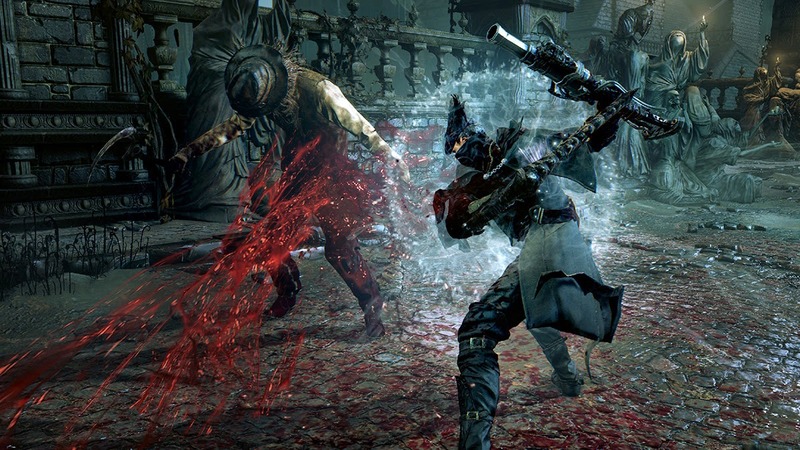 Bloodborne’s combat boils down to approaching an enemy, hitting them until they start to wind up their attack, and then dodging it or interrupting it to cause more damage. Every action performed costs a certain amount of stamina, whether it be running, dodging, or attacking. Stamina conservation and management, while playing a big part in the Souls games, is not nearly as strenuous. Stamina regenerates almost immediately after finishing an action, and it will be full again in a matter of seconds. Health is obviously also a factor, your character dies incredibly fast if you aren’t careful, every enemy is a threat and should be treated as such, but with the new focus on speed, it is much easier to prevent taking damage in the first place. 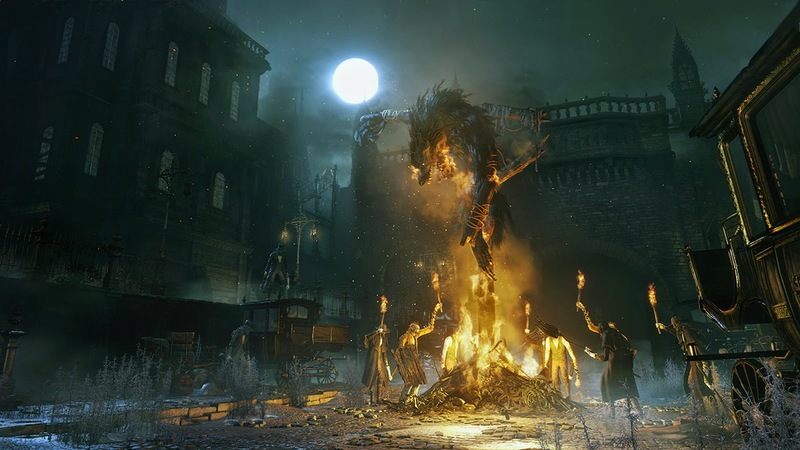 Bloodborne is much easier than it’s predecessors due this increase in speed. 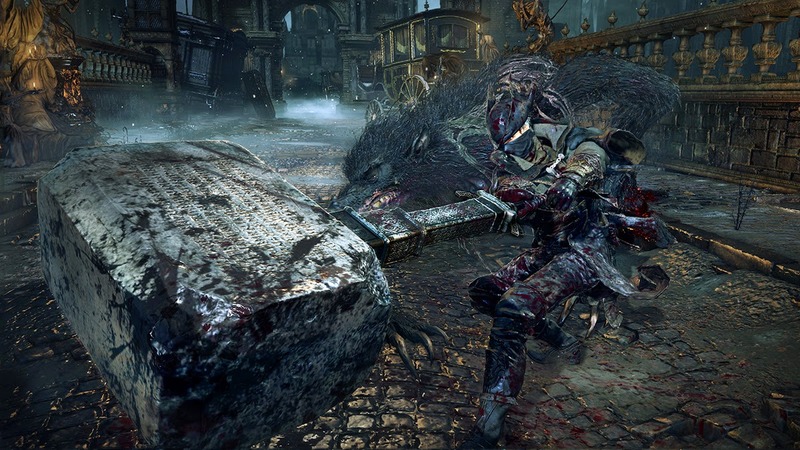 The focus on speed in Bloodborne comes at the price of losing control over your character, the dash moves you about 5 feet in any direction, but most of the time, you’ll hit a wall or some obstacle, stopping you in your tracks and most likely killing you. The most interesting mechanics introduced in Bloodborne include “trick weapons” and multiple guns. “Trick weapons” serve as the main melee weapons in Bloodborne, each weapon has two forms, a standard, and an alternate. Standard typically being smaller and faster than it’s alternate counterpart. This system is incredibly well done, making it so that every weapon has double the moves and a much wider range of uses in combat. Most, if not all of the “trick weapons” are well designed and interesting in their own ways, complimenting many different play styles and looking cool at the same time. The guns range from pistols and shotguns to flamethrowers and magic watering cans. The guns, at least at the beginning, are not used to damage and kill enemies, but to stagger them. Staggering an enemy calls for shooting them while they are winding up for an attack, although the timing is specific to each enemy, or hitting them in the back with a fully charged melee attack. After staggering an enemy, a follow up attack called the “visceral attack” is suggested, dealing massive damage and making you invincible while performing it. The stagger system is one of the most rewarding things in Bloodborne, making you feel powerful and striking fear into the enemies who bear witness to it, I’m not kidding, enemies will cower in fear if you perform the visceral attack in front of them. 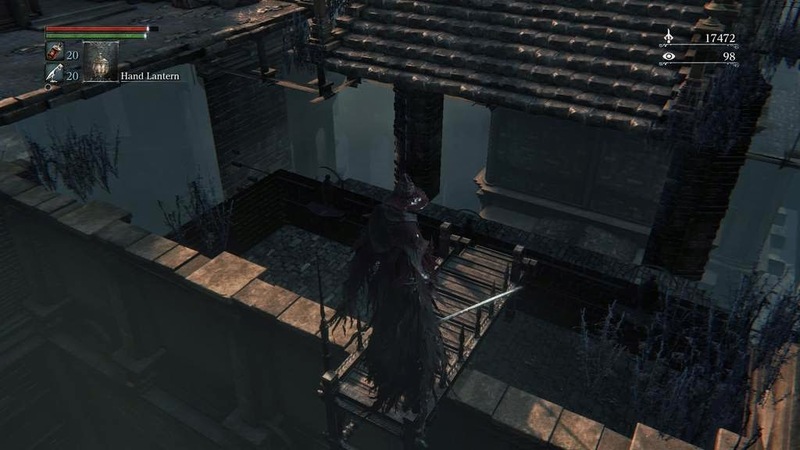 The chalice dungeons of Bloodborne are randomly-generated dungeons that are accessible from the “Hunter’s Dream” , the main hub that connects every area in the game. You must defeat certain bosses to acquire base chalices, used with other items to create dungeons. The dungeons themselves, while not rewarding at first in terms of loot, offer many new environments to explore in addition to new enemy and boss types, and small gimmicks like reducing your health to half. You could look at these dungeons as the “challenges” of the game, not required to beat the game, but they are there to test your mettle and add to your playing time. The chalice dungeons are not important to completing Bloodborne, but I highly suggest that if you play Bloodborne, you should definitely give them a try. There are two currencies in Bloodborne, blood echoes, gained by defeating enemies and selling items,and insight, gained by encountering and defeating bosses. Blood echoes are the general use currency of Bloodborne, used to buy items, upgrade weapons and your character’s stats. Insight is used to buy special items, and summon co-op partners. 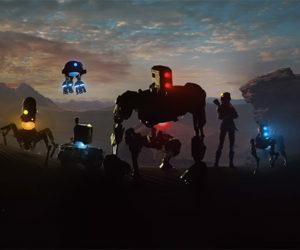 There is multiplayer in the game, both cooperative and competitive. You can summon up to two partners to help you get through any area in the game that contains a boss. Alternatively you can be summoned to help someone else, this rewards you with half of the blood echoes you would normally earn, and insight upon defeating a boss. If you’re feeling devious, or just want to fight honorably, you can invade another world in order to kill it’s “owner”, in other words, another player. This has worked extremely well in the Souls series previously, but in Bloodborne, it comes off as clunky and I couldn’t get it to work more than a few times. There are only a few places you can invade or be invaded, but these areas aren’t suited for fair PvP, one of them having a constant area effect that can damage you immensely, whilst not hurting the invading player whatsoever. Bloodborne tells most of it’s story through item descriptions, small bits of dialogue, the enemies and the scenery. If you like to go out of your way to learn the lore of a game, then Bloodborne is perfect for you. If you like linear storylines however, then this game has very little to offer. Sadly, the biggest downfall of Bloodborne is it’s lack of polish. The load times can take anywhere from 30 seconds to a minute, but the length isn’t the issue I have, it’s that the loading screen has nothing but a logo on it, whereas the Souls games had item descriptions cycle, giving you something to do on the loading screens. The frame-rate drops constantly. Enemies can hit you through the environment. (ie. Walls, rocks, tree, etc…) Enemies can also hit you through other enemies without hurting each other, inconsistently. Some enemies can kill each other, and sometimes you’ll get a molotov cocktail thrown at you through a giant axe wielding knight. The hitboxes go from being decent to absolutely terrible at times, making you take damage even when you are nowhere near an enemy's attack, or allowing an enemy to escape your attack when it clearly hit them. Enemies can fall through the floor, clip into walls, and sometimes turn invisible, while still being able to hit you. I once had the floor disappear, making it impossible to proceed without reloading the area, making me lose all progress and having to fight all the way through the area one more time. On another note, if you die and then exit the game, you lose all your blood echoes, I don’t know if this is a bug or a “feature” but it was incredibly annoying. Alone, these issues could be forgiven, but taking them all into account shows that this game was not ready at launch, and with new glitches being reported every day, things aren’t looking good for the technical aspects of Bloodborne. Bloodborne is still an action-rpg, but with the focus heavily weighed on the side of action, having only six upgradeable stats. When I played through the game, I just threw around my upgrade points to whatever helped me best at the time, and there is very little reason to do otherwise. If the weapon you want to use requires 15 arcane, upgrade your arcane to 15 and you might never have to touch that stat again. Bloodborne looks amazing, by no means the best looking game on next-gen, but I’m not just talking about resolution and frame-rate. The environments are incredibly well realized and varied, striking awe and fear in equal measure. Bloodborne can be macabre and dark, but also breathtakingly beautiful at the same time. Design-wise, everything in Bloodborne is fantastic, from the designs of the numerous “trick weapons” and guns, to the enemies and the scenery, no matter where you go, there will always be something to look forward to. The sound design of Bloodborne is also fantastic, although this is mostly in regards to the sound effects. The music rarely plays any part in the game aside from being ambient noise, although sometimes appearing during boss fights to add to the tension, but it wasn’t anything special. The trophies are simple and can be easily obtained with a bit of time and work put into earning them. I earned the platinum trophy in approximately 70 hours, significantly less time than any of the Souls games. The platinum trophy is by no means the end of the content in Bloodborne. There are many chalice dungeons to explore, especially with them being randomly-generated. 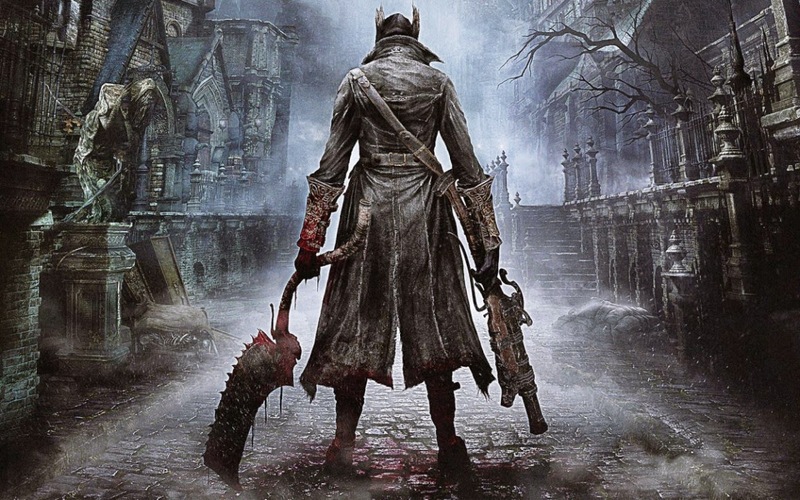 Given how many different ways you can play Bloodborne, there are potentially hundreds of hours to play, whether you want to play with the same character through multiple playthroughs, increasing in difficulty each time, or if you want to play through multiple with different characters. Bloodborne is a great game with a lot of issues. Most of the issues I mention didn't ruin the overall experience for me, but it definitely damaged it. With a little more time to iron out these issues, Bloodborne could have gone from being a great game, to one of the best I’ve played. What I played: I spent around 70 hours playing through the game, 45 on my first playthrough, and 25 cleaning up the trophies in New Game plus. I spent around 10 of those hours in the chalice dungeons.